Two-part expanding polyurethane foam for permanent flotation, thermal insulating, and soundproofing. Its easy-flowing formula conforms quickly to fill the cavity it's poured into. Available in 2 lb. or 6 lb. density, in 2-Quart and 2-Gallon kits. 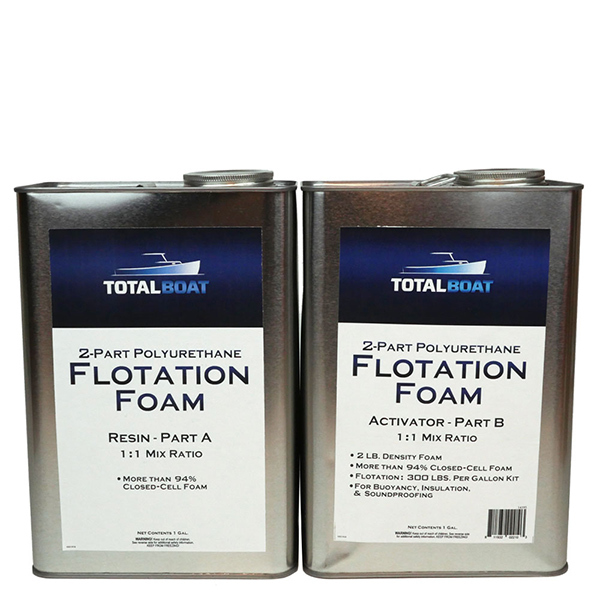 TotalBoat Flotation Foam is great for filling voids, especially under decks. It’s thermal and sound-proofing abilities make it ideal for a number of other insulation and flotation applications. 94% closed-cell structure lets it maintains buoyant pressure even after prolonged exposure to water. This 2 part pour-in-place expanding polyurethane foam reaches full expansion in about five minutes, and can be poured in multiple layers with excellent bonding between layers. The cured foam hardens into shape with minimal shrinkage, is not affected by gas or oil, and resists mold and mildew. Once fully cured, foam can be laminated over with polyester, epoxy, or vinyl ester resins. Compliance: Both foam densities have been tested in accordance with the USCG Regulation #33 CFR 183.114. Note: Continuous water submersion can eventually lead to loss of buoyancy over a period of years. Volume: The 2-quart kit expands to approximately 2 cubic ft.; the 2-gallon kit expands to approximately 8 cubic ft. Note: Accurate measuring of resin and activator is extremely critical. All expansion rates and times listed are dependent on temperature. Temperatures below 75°F will lower the expansion rate, which will require more flotation foam. Volume: The 2-quart kit expands to approximately 3/4 cubic ft.; the 2-gallon kit expands to approximately 3 cubic ft.